The speculative bubble in the housing market began to burst in the United States in 2007, and has been followed by ruptures in virtually every asset market in almost every country in the world. Each country proposed a range of policy initiatives to deal with its crisis. Policies that focused upon stabilizing the housing market formed the cornerstone of many of these proposals. This internationally focused book evaluates the genesis of the housing market bubble, the global viral contagion of the crisis, and the policy initiatives undertaken in some of the major economies of the world to counteract its disastrous affects. 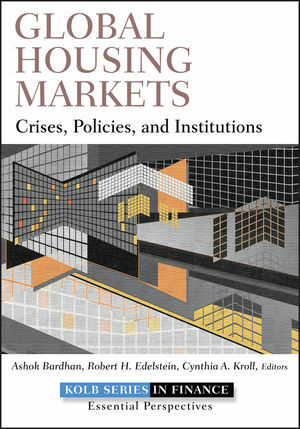 Unlike other books on the global crisis, this guide deals with the housing sector in addition to the financial sector of individual economies. Countries in many parts of the world were players in either the financial bubble or the housing bubble, or both, but the degree of impact, outcome, and responses varied widely. This is an appropriate time to pull together the lessons from these various experiences. Filled with the insights of well-known contributors with strong contacts in practice and academia, this timely guide discusses the history and evolution of the recent crisis as local to each contributor's part of the world, and examines its distinctive and common features with that of the U.S., the trajectory of its evolution, and the similarities and differences in policy response. ASHOK BARDHAN is Senior Research Associate, Fisher Center for Real Estate and Urban Economics, Haas School of Business, University of California, Berkeley. ROBERT H. EDELSTEIN is Professor, Maurice Mann Chair in Real Estate, Haas School of Business, University of California, Berkeley. CYNTHIA A. KROLL is Executive Director, Staff Research and Senior Regional Economist, Fisher Center for Real Estate and Urban Economics, Haas School of Business, University of California, Berkeley.